According to the data and stats that were collected, 'Pollution Facts' channel has a poor rank. The feed was last updated more than a year ago. 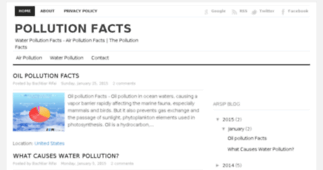 In addition 'Pollution Facts' includes a significant share of images in comparison to the text content. The channel mostly uses long articles along with sentence constructions of the advanced readability level, which is a result that may indicate difficult texts on the channel, probably due to a big amount of industrial or scientific terms. 'Pollution Facts' provides mostly long articles which may indicate the channel’s devotion to elaborated content. 'Pollution Facts' contains materials of advanced readability level, which are probably targeted at a smaller group of subscribers savvy on the subject of the channel. 'Pollution Facts' contains more negatively biased articles than positive or neutral ones (e.g. it may include some critical or negatively biased opinions on the subjects addressed on the channel). Unfortunately Pollution Facts has no news yet.